Speedy Kevin: On Vacation! + 31/35 VMax on the way! Currently on vacation with Vivian up to norcal to check out the 34th America's Cup! I must say the AC72s, while impressive on video, are definitely something to see in person. Just watching the catamarans "fly" on their foil was quite impressive. Team New Zealand's boat was hitting speeds of up to 34 knots in what I would consider marginal windsurfing conditions! I didn't purchase any tickets so Vivian and I went over to the Marina Park/America's Cup Village to watch the race on tuesday (Round Robin 4) which pitted Team New Zealand against Luna Rossa. The Kiwi's had a good start and just kept the hammer down all the way till the end. I can't recall exactly what the exact distance was but at one point in the race they were over 3200 meters in the lead! Well done! Besides the race, I was hoping to get some merchandise, preferably Oracle gear, but gee a hat would set me back $45 :( Oh well I'll just buy the 34th AC gear when the 35th AC happens :D. There is bound to be some good discounts than! Anyways I'll be heading back to Socal tomorrow morning in hopes of getting in a afternoon session at Cabrillo. Seems like this week is going to be good so definitely will try to get some more time and experience with the AHD SL1 "Jaeger" :). Good news is Jurg @ WindSurfDeal placed an order for me for a 31 and 35 VMax. He said it should be in some time next week so I'm definitely excited. Now I'm not saying that the Select SL7 is a bad fin, it is actually a pretty good fin. 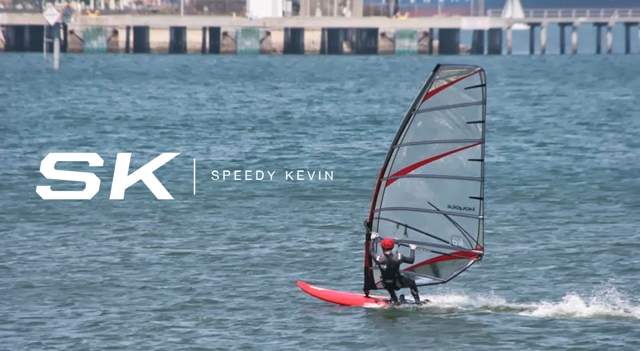 It has very similar upwind performance to my Select RS7, which I consider to be one of the best upwind performing fins I have ever used, but the difference occurs in rough conditions. I always felt that the RS7 was trying to break my legs in rough conditions but I never had that problem with the SL7 (S09 still is the king in rough waters). So yes the SL7 is a good fin but after using the VMax, I can honestly say the only fin I want to use is a VMax :D. Something about it just makes it ...special. You have to try one to see what I mean.